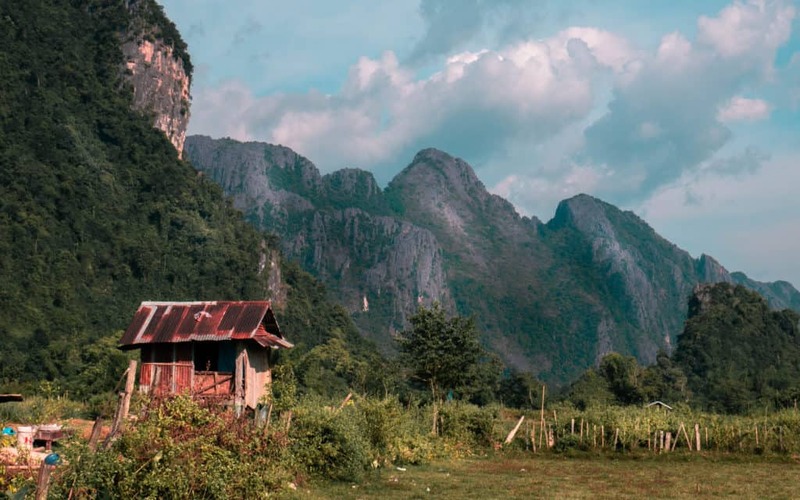 Besides Kuang Xi, Vang Vieng was on our top most awaited places to visit in Laos. 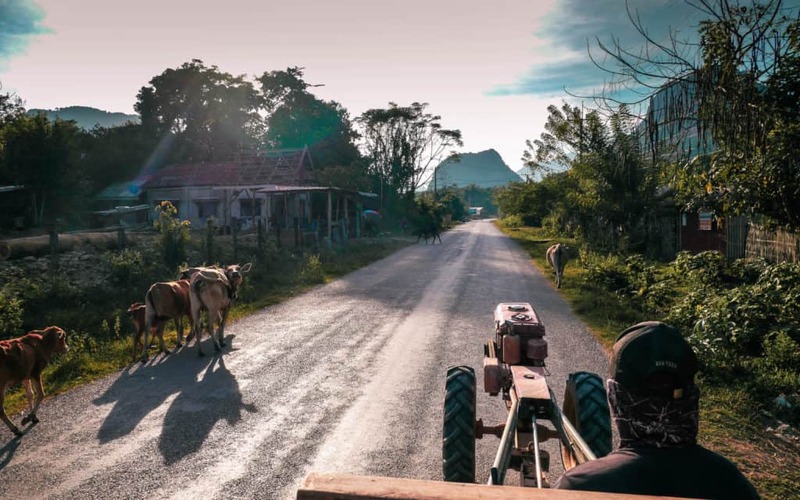 Based on the images and videos we had seen as part of our research of things to do in Vang Vieng, we already knew this trip was going to be a unique travel experience. Picture tall limestone karsts, lush greenery, blue lagoons and the very chilled Lao speed of life. A scene perfect for all sorts of activities - from the most simple and easy to the more adventurous and challenging ones. 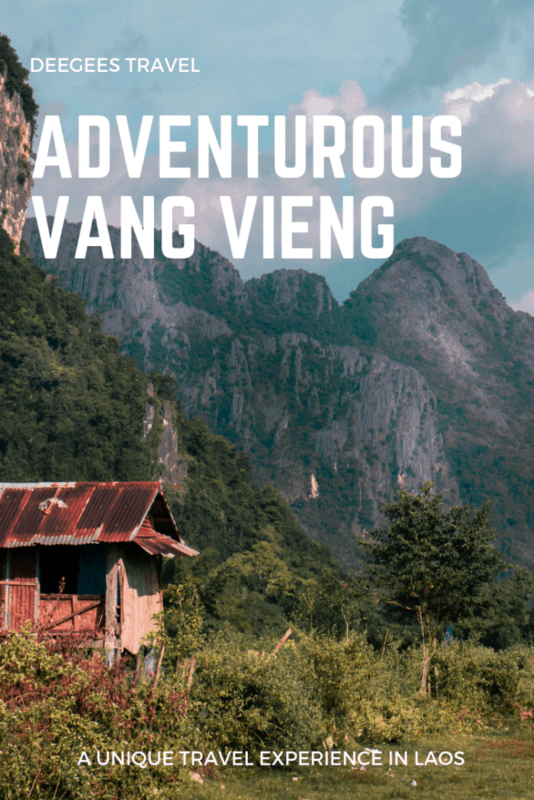 Here below is the list of the most awesome things to do in Vang Vieng, their respective costs and a rating on our chilled to adventures scale. First Off, What is Tubing? 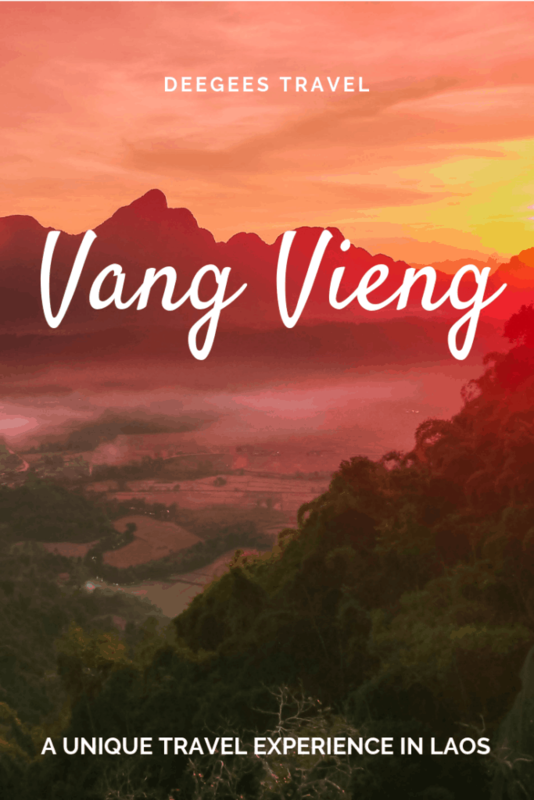 Why is Vang Vieng Tubing Such a Big Deal? If you’ve done any research about things to do in Laos, Vang Vieng tubing must have come in your top search results. Why? Let us give you some context. Tubing refers to floating down a river or a lake on an inflated inner tube of a truck tire. Vang Vieng tubing is a free-floating one, using the carrying power of the Nam Song River current. Fun fact - according to the Time magazine publication in 1966, it was Thailand’s Princess Chumbhot of Nagar Svarga who invented this lazy fun water activity. Go Princesses! Until 2011 there were little to no regulations with regards to safety around the water activity which had become one of the most prominent things to do in Laos. Countless ramshack bars playing loud party music offered free shots for any passer-floaters. 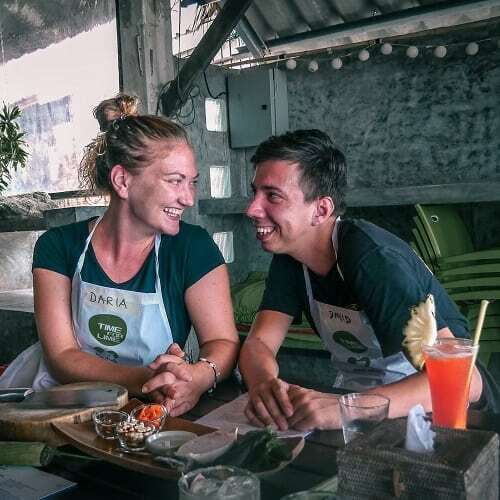 Beers, cocktails and “happy” versions (using cannabis instead of other common ingredients) of any food dominated the backpackers’ daily menus. 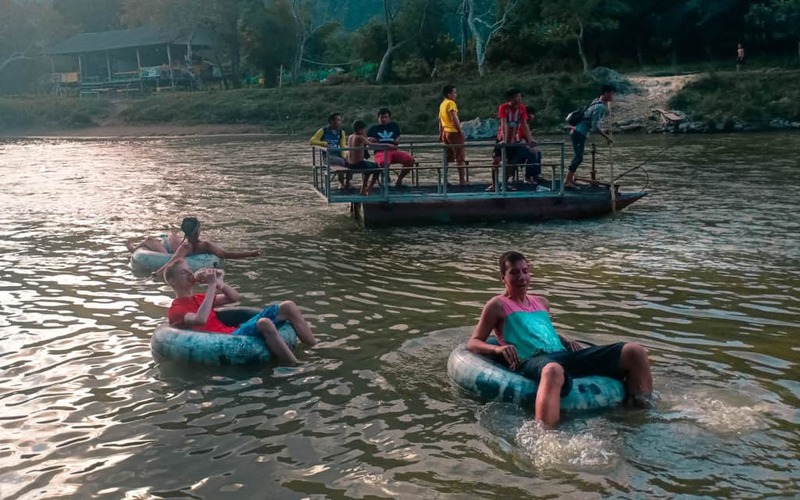 Since the total journey on the tube takes about four hours (without many stops), this resulted in Vang Vieng tubing enthusiasts becoming so wasted they could no longer get out of Nam Song River. In the final year of the uncontrolled Vang Vieng tubing fun 27 deaths were recorded. This resulted in the Lao government stepping in and cleaning up the scene. Although the famous Laos party river activities are not what they once were, Vang Vieng tubing is still a fun activity to do. The scenery with limestone karsts and lush greenery surrounding the Nam Song river are gorgeous. Since the majority of river bars have closed, Vang Vieng tubing today is less of a party but more of a lazy nature appreciation activity. When we visited in the end of November, there was almost nobody else besides us on the Nam Song River. That being said, there are still three bars where you can stop and grab a cold beer from. In the busier seasons you might meet more fellow travelers to get the feel of what the old party days looked like. Pro tip: Get out at Smile Beach Bar to warm up at the campfire, it's also within a walkable distance from town center. The very inviting blue waters! Visiting Vang Vieng lagoons, like tubing, is one of the more popular things to do in Vang Vieng. 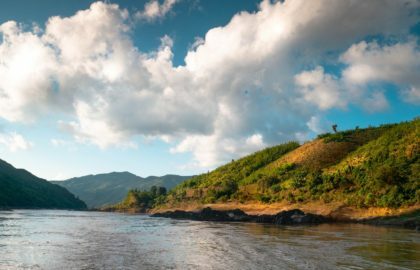 Although there are countless lagoons in the area, the most frequented and the most developed ones in terms infrastructure are the uncreatively called Vang Vieng Blue Lagoons 1, 2 and 3. The unbelievably colored natural pools are frequented by tourists and locals alike. The latter usually spend an entire day with their families, doing BBQs and enjoying the clear warm waters. Vang Vieng Blue Lagoon 1 is only 7 km away from the town center and is therefore easily reachable with any means of transport. We opted for the ultimately slow-paced one - walking. Yes, it was very hot but yes, we really enjoyed it. The jump into the unexpectedly but refreshingly cold blue waters felt like a deserved reward. Its close proximity to town makes Vang Vieng Blue Lagoon 1 the most popular of the public natural pools in the area. You know, a true hidden gem 😉 (NOT). There is a lot of space to set up a little camp, but you need to come early to beat the crowds. 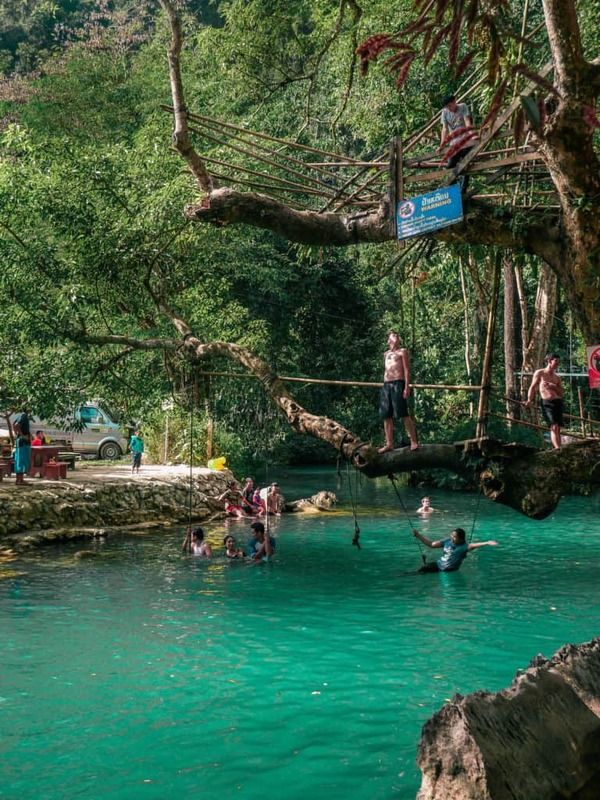 One of the more fun things to do at the Vang Vieng Blue Lagoon 1 is jumping from a 2 or 5 m platform set up on a tree, swinging in the water or flying on a zipline. You can also visit the Tham Phu Kham Cave if you get tired of people and sun. Vang Vieng Blue Lagoon 2 (aka Nature Park Patong Cave & Bubbling Springs) is the second most popular option among Vang Vieng visitors. The Blue Lagoon 2 has a couple of pools, platforms and sunbeds. There is even a separate VIP area for those willing to pay more for some privacy. Vang Vieng Blue Lagoon 2 is 7 km from Vang Vieng Blue Lagoon 1. Vang Vieng Blue Lagoon 3 is the furthest away from Vang Vieng and therefore remains the least crowded one. If you want to visit Vang Vieng Blue Lagoon 3, you would need to get on a motorcycle or get a tuk-tuk because the distance is not walkable (17 km). The favourite thing to do at the Vang Vieng Blue Lagoon 3 is trying out various daring flips from a rope swing above the lagoon. You can also use a zipline do jump into the blue waters. Yey! Vang Vieng Blue Lagoon 3 is arguable the most fun of the three popular natural pools. Price: 10’000 KIP (15’000 KIP if on a motorbike). Effort: Generally pretty chilled, depends on your water stunt aspirations. Due to the landscape surrounding the town, there are many caves around Vang Vieng. Most are reachable on a bicycle or motorbike and are often part of one of the many organized packaged tours. Here below are the top 3 most interesting Vang Vieng Caves. Tham Nam Cave is a water one, you can experience it by floating in a tube. Visiting this water cave is a very unique experience. The cave gets rather crowded during the high season leading to long waiting times. If this is when you visit, try to stay positive and use the time to meet your fellow travelers. Tham Phu Kham Cave is at the Vang Vieng Blue Lagoon 1. If you get tired of tourist crowds splashing in the azure waters and need a physical challenge - take a steep 10 min climb to reach this much more secluded natural escape. As you move past the reclining Buddha at the beginning of the Tham Phu Kham Cave, all becomes quiet and serene. Tham Loup & Tham Hoi Caves are close to each other and can be visited at the same time (the caves are 400m from Tham Nam). What makes the caves an adventurous activity is their lack of rails, wooden bridges and light. If you are an experienced cave explorer you can spend a lot of time going deeper into the massive caves. Alternatively you can get a local guide, but beware of scammers. Want to visit more caves? Check out Travelfish’s list of other Vang Vieng caves. Pro tip: Wear dry/wet shoes + reliable (fully charged) headlight or torch. Effort: From rather easy-peasy to adventurous explore depending on where you go. 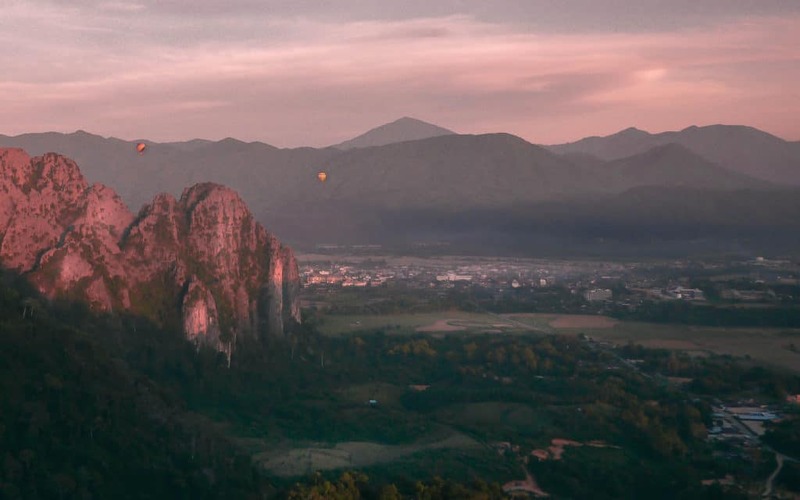 One of the more uplifting things to do in Vang Vieng is taking a ride in a hot air balloon (ba dum tss!). In comparison to many other places in the world, flying in a hot air balloon in Vang Vieng is much more affordable and is therefore a unique travel experience you shouldn’t miss. Although you won’t receive the same safety briefing as in the Western part of the world, the pilots are known to be very experienced, so you have nothing to worry about. Pro tip: Time your hot air balloon Vang Vieng trip around sunrise or sunset as the views are even more stunning then. Price: 90 USD incl. transfer. Time: 30-45 min in air. Effort: Mostly mental to combat any fears of height, flying or unreliable security regulations. 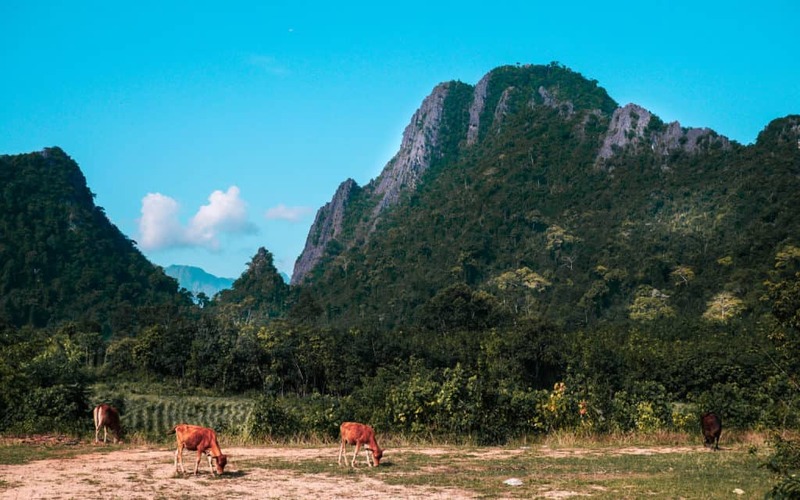 Hiking was one of our favourite things to do in Vang Vieng. Having crossed the Nam Song River, within minutes we left the town center and found ourselves in the middle of rural Laos. We passed by smaller settlements, farm fields with local people going about their business, cows confidently claiming their priority right on the road, drivers on self-made tractors (we even got a short but very exciting ride in one!) - all set among proud limestone karst mountains and green forests. This kind of slow travel was perfect not only to embrace the magnificent nature, but also to meet the locals on the way. Occasionally we stopped to chat with Lao people or explained to local tuk-tuk drivers why on earth would be voluntarily choose to go hiking in this hot weather. It always resulted in a fun exchange so the time simply flew by. Effort: Medium (and very sweaty), depending on how far and how long you decide to hike for. Rock climbing in Vang Vieng is a fairly new activity (since the beginning ‘00s). Nevertheless, these days there are over 200 routes ranging from 4a to 8b. Multiple rock climbing schools offer beginner classes starting from a half-day course to see if this is something you want to pursue. There are also multiple day courses for the more committed ones. 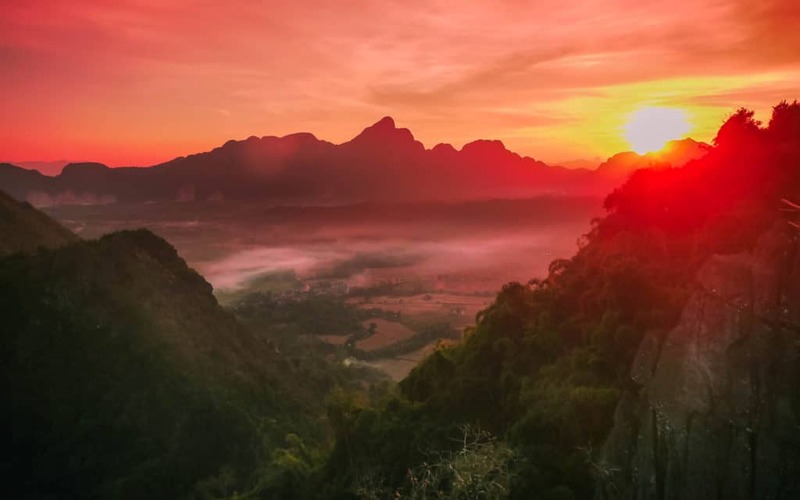 The views you see while doing rock climbing in Vang Vieng are absolutely stunning making it a very memorable and unique travel experience. Pro tip: The season for rock climbing in Vang Vieng is October to May (otherwise too wet). Price: Half-day course costs ca. 180’000 KIP, a full day ca. 260’000 KIP. Views worth climbing the rocks in flip flops for! There are multiple viewpoints you can climb to take an elevated view over Vang Vieng. 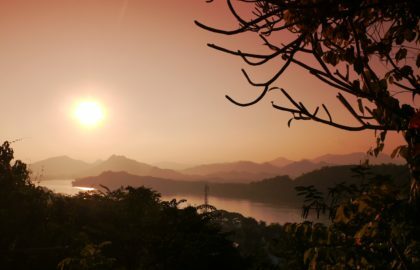 For us, climbing up the Pha Ngern viewpoint turned out to be one of the most memorable things to do in Vang Vieng. Unlike many other places during our backpacking Southeast Asia, this viewpoint is not overrun with tourists and is barely commercialized. To our big surprise, the hike up the viewpoint turned out to be significantly longer than anything we had anticipated. Keeping a pretty good pace for 30 min, we were bewildered to hear the lowest viewing terrace is another half hour hike up the steep pathway. When the same was repeated by multiple hikers going down, the realization slowly dawned on us... We were at the wrong viewpoint (see, originally we planned to go to Nam Xay viewpoint which is significantly easier). As we continued our ascend the sun started to slowly set. Stubborn and not scared of challenges we pushed on. I have to admit, since I thought I was going for a simple walk … I wore the worst possible footwear - flip flops. Oh the looks I got from fellow travelers! I know, I know - NOT smart. Ironically, I was giving identical looks to people committing the same crime while hiking the Ijen volcano in Java. Lesson learned - do not judge, so that you won't be judged. The gravity of my poor decision became especially apparent once the already uneven and steep path turned into a full on rock climbing. Did it stop us? No. We got to the lowest terrace of the viewpoint just in time for sunset. The view was absolutely worth every single nerve cell lost along the way. We were filled with joy and pride for not having given up. We watched the sunset and started our descent to have at least the rock climbing part covered before the darkness covered the forest. On our way down we met monks climbing to the top of the viewpoint. Boy, will they have an amazing sunrise view! Pro tip: Start around 2-3 PM to have enough time to climb the Vang Vieng viewpoint, chill and take in the views. Effort: Pretty high, especially if you have wrong shoes (or if you're at the wrong viewpoint). There are many different opportunities to go ziplining in Vang Vieng, starting from the caves, the blue lagoons or the dedicated adventure parks. Most of the time Vang Vieng Zipline adventures are packaged with Elephant Cave visits, kayaking and alike. You will see various packages being offered on every street corner, including guesthouses. If you want to go with a reliable partner, check out Klook or GetYourGuide. Effort: Just the right amount to keep things exciting. Yoga has become part of our daily lives so doing yoga in Vang Vieng was definitely something we didn’t want to miss. 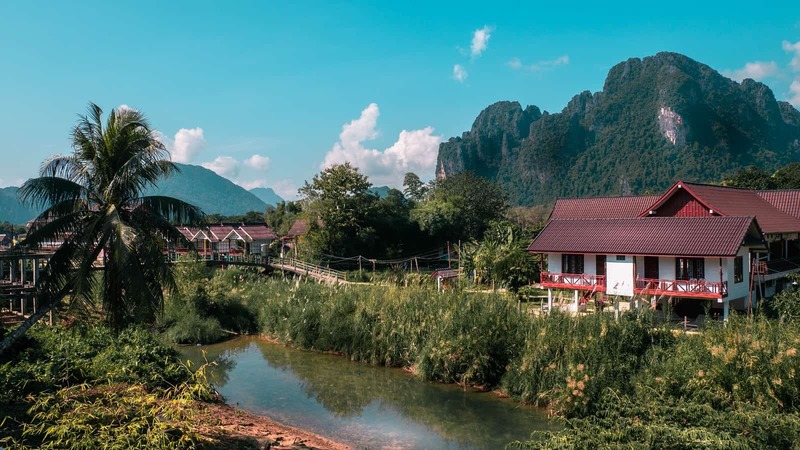 Although there are not many options when it comes to yoga in Vang Vieng, we found the Silver Naga Hotel offer to be even more than what we had expected. Qualified teachers, air-conditioned yoga studio, free daily access to the outdoor pool next to a bar selling delicious healthy fruit juices - yes, we’ll take it! Silver Naga Hotel offers yoga classes twice daily - at 07:30 AM and 05:00 PM, both running 90 minutes. Occasionally there’s a 04:00 PM sunset yoga class in the outdoor shala overlooking the scenic Nam Song River and the mountains behind Vang Vieng. We had a great experience doing yoga in Vang Vieng and would definitely recommend it as a great change of pace. After enjoying a couple of nights sharing Beerlao with our new friends, this was on the more zen side of things to do in Vang Vieng. Pro tip: take a 2-class pass, start the day with morning yoga, spend the day at the pool and enjoy an evening session before launching into Vang Vieng nightlife. Price: 120'000 KIP for two classes. Although Vang Vieng may not attract as many 20-something-years-old party-seeking backpackers as it used to a decade ago, the town still has a couple of lively bars open way past Cinderella’s curfew. The majority of Vang Vieng nightlife is located between the main street and the Nam Song River. You can simply follow the music to find your entertainment for the night or check out Culture Trip’s top 10 bars in Vang Vieng. As pretty much anywhere else in Southeast Asia, you will be constantly offered some sort of drugs. Beware that many dealers work in collaboration with the police who are on the mission to reduce drug consumption in Vang Vieng after the governmental crackdown back in 2011. Some hostels even keep track of the amount of backpackers arrested monthly. The choice is yours. The best party people ever! Our preferred Vang Vieng nightlife option was chilling at the Chillao hostel where our awesome travel buddies were staying. The very unlikely yet incredibly fun group we explored Laos together with definitely contributed to us hopelessly falling in love with Laos. One of our favourite things to do in Vang Vieng was having a couple of rounds of beers (which we could buy cold in a shop next doors) in this travel companionship, occasionally spicing it up with the free Lao whiskey shots offered at the hostel bar. Btw, the hostel is run by a friendly Vietnamese family who also helped us organize our 60-day visa to Vietnam. Price: 10’000 KIP (1€ / 1.2$) for a Beerlao to infinity. Time: tends to get lost. Effort: does not require special preparation nor skills until the following day when a considerable previous experience is a plus. 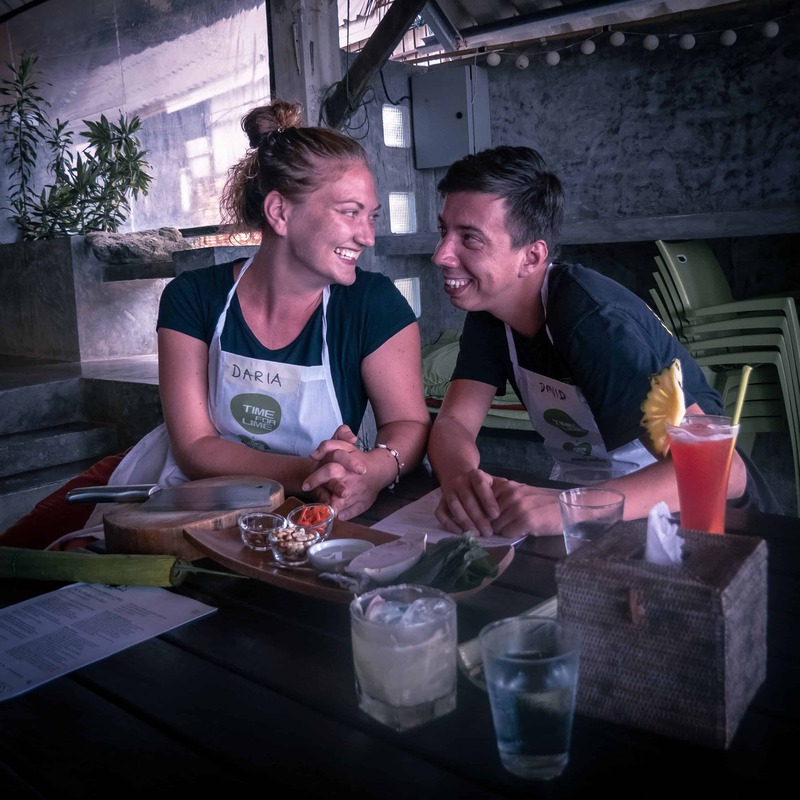 If you’re not in the mood for Vang Vieng nightlife, yet want to do something entertaining after the sunset, then Vang Vieng Night Market might be just the option for you. The night market is located in the town center and spreads over a couple of blocks. You will find a variety of typical Lao souvenirs, clothes and a occasional food stalls, mostly offering BBQ. Although the latter is not the cheapest food option in Vang Vieng, it does come with a lively social atmosphere. Although we didn’t intend to buy any souvenirs nor Beerlao t-shirts, we still found the Vang Vieng Night Market a fun thing to do in Vang Vieng in the evening. Price: plenty of random often useless things to bring back home for a couple of bucks. Time: 30 - 90 min. Effort: Low. Spice it up by launching in an emotional bargaining competition with a local market lady. 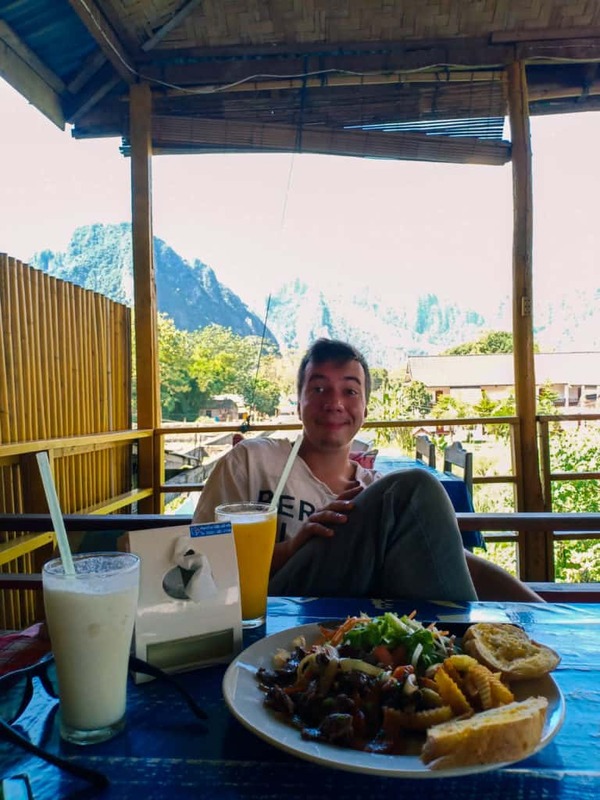 If like us you’re also into slow travel, then you should not forego the opportunity of winding down and just chilling in Vang Vieng. Get off the main road, find yourself a quiet corner and enjoy the fresh air and the view over the Nam Song River and the limestone cliffs. 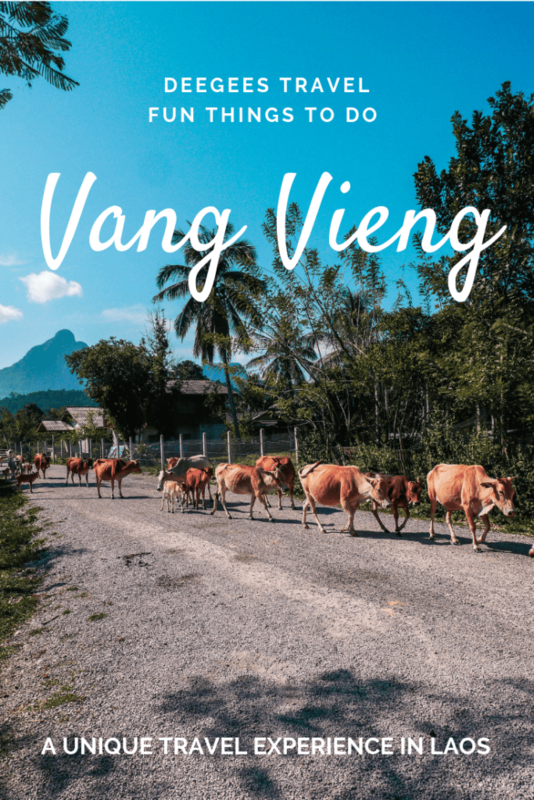 Read a book, listen to a podcasts, write a blog or meet the locals - there are plenty of chilled things to do in Vang Vieng. The surrounding nature sets exactly the right mood for that. 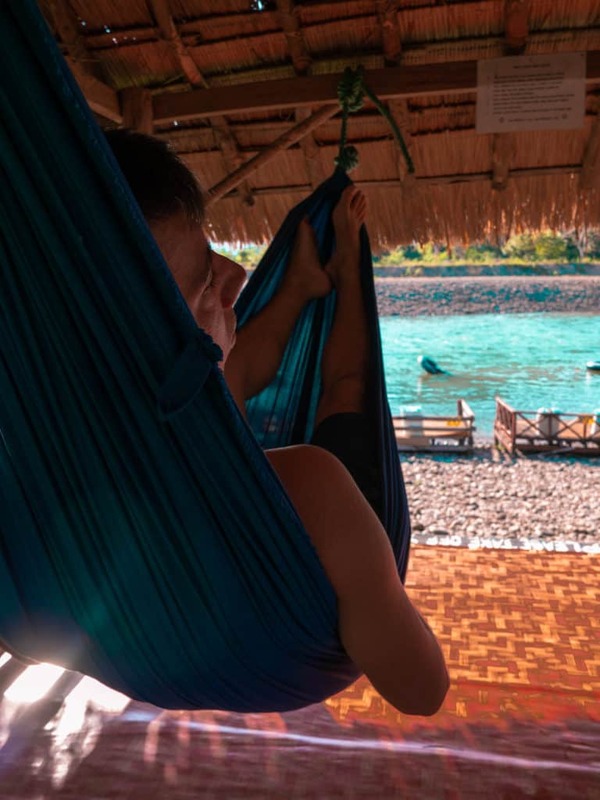 Hammocks at the Smile Beach Bar are especially good for that. Time could just stop here. We could have easily stayed in Laos and especially in Vang Vieng much longer had we not have to meet David’s dad and start our travel adventures in Vietnam. Vang Vieng is one the most amazing places to visit in Laos and we’re definitely going to be coming back for more. You have to try grilled duck at a small local place next to Parisian Pizza King. The meal comes with a plate of veggies and green herbs. It is to die for! Also, one of the cheapest beers in the area. Our almost daily go-to place for simple yet delicious food with friendly service was in a restaurant just next to the Full Moon Bar. 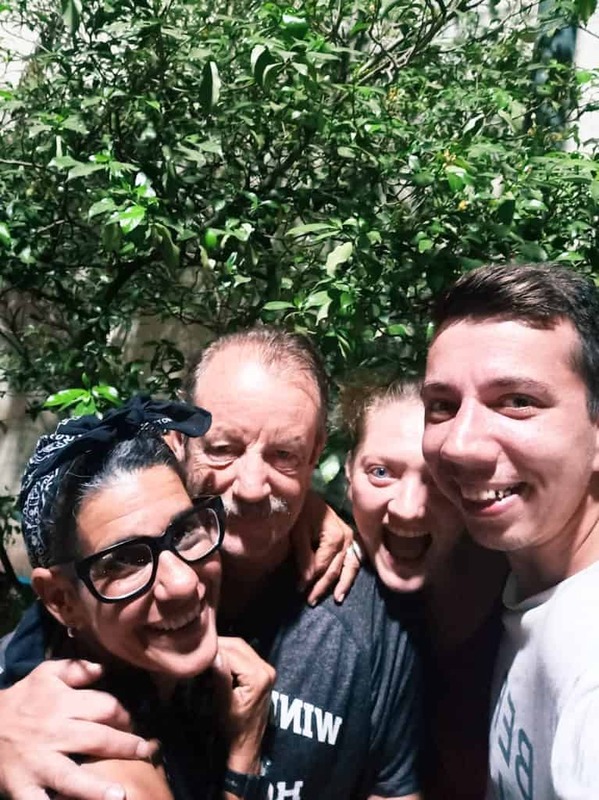 The family running the place is very sweet and has great music playlists. Yummy food with a view! Try Korean BBQ at Peeping Som's BBQ in Vang Vieng. The place is full with Korean tourists, which is a good sign for the taste authenticity. Get a yummy hot soup at Khuanchai Restaurant. The menu is in Lao only, so be adventurous. As a bonus, you can enjoy the locals singing Karaoke. Take a mixed hotpot at the Vanphaxay Restaurant. You will get a clay pot with hot water placed on a small bucket with burning coal. You can add veggies, green herbs, eggs and whatever main you ordered at your own pace. Deliciously paired with spicy Lao chili jam. The best ride we could ever ask for! Walking around Vang Vieng. The ultimate slow travel option. Loved it, would recommend it, but can’t reach many things. Consider walking one way and getting a tuk-tuk on the way back. Cycling around Vang Vieng. You can rent a mountain or city bike to get around Vang Vieng. If you’re planning on only staying on the main roads (i.e. going to Vang Vieng Blue Lagoon 1), the city one might be enough otherwise get a mountain one. Renting a motorbike in Vang Vieng. This is by far our favourite means of mid-distance transportation while backpacking Southeast Asia. We’ve had some unforgettable motorbike trips (like crossing the Hai Van Pass in Vietnam) and would always default to motorbikes to explore. Getting a tuk-tuk to get around Vang Vieng is super easy as there are tuk-tuks on virtually every corner. There are shuttle tuk-tuks driving between the town center and the key tourist attractions like Vang Vieng Blue Lagoon 1 (costs apx 10’000 KIP one way). Make sure you agree on the ride price before you get into the tuk-tuk. You can also rent a private tuk-tuk for a day and make your own Vang Vieng itinerary. Price: 10’000 KIP for a shared, 130’000-150’000 KIP for a day.If you’re traveling on a motorized vehicle before of the 10’000 KIP toll to cross Nam Song River. Vang Vieng is connected by bus lines with Luang Prabang and Vientiane. The roads connecting the cities are simply terrible at times. Bus drivers seem not to overly care about the length of bus lives and therefore rush full speed onto the endless potholes. These almost stunts result in minibuses and everything and everybody in them jump up in the air only to crash down a second later. Seat belts are there to stop you from flying too high and bumping your head against the bus roof. The bus ride from Luang Prabang to Vang Vieng was one the worst bus rides we have ever taken, but being in Vang Vieng was absolutely worth it. If it’s any consolation, the views on the way there are very picturesque. One more thing to note about getting to Vang Vieng or traveling around Laos in general. You need to have a flexible schedule and an open mind. Roads close, buses break down, the moon is not aligned with the sun - whatever it is this time, you need to be prepared to go with the flow and change your plans on the fly. The Blue Lagoon looks lovely! I love swimming in natural pools!